[시사뷰타임즈] 트럼프 대통령은 중국이 중국으로 수입되는 미국 자동차에 대해 매기는 40%의 관세를 "감축하고 제거"할 것이라고 말했다. 중국은 세부사항을 제세하지도 않은 트럼프의 발표 내용을 확인해 주길 꺼렸다. 이러한 조치는, 확인되면, 점증되는 미중 무역 전쟁으로 좌불안석인 자동차 산업들이 환영할 일이다. G20 정상 회담에서의 저녁 만찬 자리에서, 두 정상은 회담이 될 수 있도록 90일 간 관세를 인상하지 않기로 합의했다. 월요일 중국 외교부는 중국과 미국 정상이 경제팀에게 G20 회의 이후 모든 관세 철폐를 위한 "협상을 강화" 할 것을 지시했다고 말했다. 하지만, 외교부는 이러한 지시가 특정 목표를 가진 계획인지 아니면 단지 바람직한 상황을 바라는 것인지에 대해선 말하지 않았다. 무역전쟁 휴전에 소식을 듣고 아시아 증시는 반등세를 보였다. 중국의 항생 지수(Hang Seng Index)는 2.5% 상승했으며 상하이 종합지수(Shanghai Composite Index)는 2.6% 뛰었다. 일본 니케이 225 지수는 1% 올랐다..
영국의 FTSE 100 지수, 프랑스의 Cac 40 지수 및 독일의 Dax 지수는 모두 약 2% 상승하며 유럽으로 확산됐다. 무역 전쟁은 미국과 중국이 국내 생산품의 경쟁력을 높이려 하면서 서로를 관세로 가격가는 모습을 낳았다. 미국은 자국의 관세정책이 중국의 '불공정'무역 관행에 대한 대응이라며중국을 지적 재산권 도둑이라고 비난한다. 7월 이래로, 미국은 2500억 달러 상당의 중국 제품에 관세로 공격했다. 중국은 같은 기간에 미국 제품 약 1,100억 달러 어치에 대한 관세로 보복했다. 그 일환으로 미국은 중국 자동차에 대해 25 %의 관세를 부과했다. 이미 2.5%를 상회했다. 7월, 세계 최대 자동차 시장 인 중국은 미국이 수출하는 자동차에 대해 40%의 관세를 부과했다. 이 비율은 다른 무역 동반국들에게 매기는 15%보다 훨씬 높은 것이며 많은 자동차 제조업체들 하려금 가격을 인상하게 만들었다. 그의 트위터에서 트럼프는 중국이 미국에서 중국으로 들어오는 자동차에 대한 관세를 줄이거나 제거하기로 합의했다고 말했다. 그는 중국이 매길 관세의 새로운 수치에 대해선 말하지 않았고 베이징은 트럼프의 말을 즉각적으로 밝히진 않았다. 성명서에서 백악관은 중국산 제품에 대한 미국의 관세는 90일 동안 변함없이 유지될 것이라고 말했지만, 이 기간이 끝날 때 미국과 중국은 합의에 이를 수 없으며, 10%의 관세는 25%로 오르게 될 것이라고 덧붙였다. 미국은 중국이 "양국간 무역 불균형을 줄이기 위해 미국으로부터 농업, 에너지, 산업 및 기타 제품에 대해 아직 동의하지는 않았지만 매우 많은 양의 농산물을 구매하기로 합의했다"고 말했다. 양측은 백악관에 따르면 강제 기술 이전, 지적 재산권 보호, 비관세 장벽, 사이버 침입 및 사이버 도둑질과 관련한 구조적 변화에 관한 협상을 즉시 시작하겠다고 약속했다고 한다. 왕이 중국 외교부 장관은 회담 후 기자 회견에서 "주요 합의가 양국 경제 마찰의 확대를 효과적으로 막을 수 있었다"고 말했다. 그렇다. 휴전은 중국 제품 2천억 달러 어치에 대해 계획했던 관세 인상을 막는다. 그러나 7월 이후 목표로 하는 중국 물품 총 2500억 달러에 적용되는 관세는 철폐되지 않는다. 이 정전은 또한 중국이 보복조치로 미국 물품 1,110억 달러 어치에 대해 부과한 기존 관세에는 영향을 미치지 않는다. 두 사람의 합의가 문제를 해결할까? G20 회의 결과가 예상보다 좋았지만, 양국이 근본적인 차이점을 어떻게 해결할 것인지는 분명치 않다. 옥스퍼드 경제학부의 아시아 경제학 대표인 루이스 쿠이즈스는 합의 자체는 긍정적이지만, 그 다음 조치는 불분명한 채로 남아있다고 했다. 그는 “우리가 더 많은 단계적 축소를 보게 될지 아니면 워싱튼의 정치적 결정에 대폭 의지해야하는 일시저긴 보류일지 모르는 이 애매함이 계속 상황을 불확실하게 만들어 갈 것”이라고 했다. Beijing will "reduce and remove" the 40% tariffs it places on US cars imported into China, US President Donald Trump has said. China has declined to confirm President Trump's announcement, which he made on Twitter without providing details. On Monday, China's foreign ministry said the presidents of China and the US had instructed their economic teams to "intensify talks" towards removing all tariffs following the G20 meeting, However, it did not say if that was a plan with specific goals or something that was merely desirable. Asian markets rallied after news of the trade war truce. In China, Hong Kong's Hang Seng index climbed 2.5% and the Shanghai Composite index jumped 2.6%. Japan's Nikkei 225 index rose 1%. The gains spread to Europe, with the UK's FTSE 100 index, the Cac 40 in France and Germany's Dax index all up by about 2%. The US says its tariff policy is a response to China's "unfair" trade practices and accuses it of intellectual property theft. In July, China, which is the world's largest market for cars, imposed a 40% tariff on US vehicle imports. The rate is much higher than the 15% it places on other trading partners and forced many carmakers to raise prices. In his tweet, President Trump said Beijing had "agreed to reduce and remove tariffs on cars coming into China from the US". What was agreed at the G20? In a statement, the White House said US tariffs on Chinese goods would remain unchanged for 90 days, but added: "If at the end of this period of time, the parties are unable to reach an agreement, the 10 percent tariffs will be raised to 25 percent." 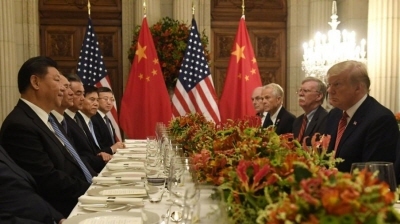 The US said China agreed to "purchase a not yet agreed upon, but very substantial, amount of agricultural, energy, industrial, and other products from the United States to reduce the trade imbalance between our two countries". Both sides also pledged to "immediately begin negotiations on structural changes with respect to forced technology transfer, intellectual property protection, non-tariff barriers, cyber intrusions and cyber theft", according to the White House. Are tariffs still in place? Yes. The truce prevents raising tariffs as planned on $200bn worth of Chinese goods. Will this resolve the dispute? "There should be no wishful thinking that the truce would end the trade war between the world's two largest economies," DBS strategist Philip Wee wrote in a research note. Louis Kuijs, head of Asia economics at Oxford Economics, said while the agreement itself was "positive" the next steps remained unclear. "Whether we will see further de-escalation or whether it is temporary reprieve continues to be very much up to a political decision in Washington DC - that will continue to make this uncertain," Louis Kuijs, head of Asia economics at Oxford Economics said.